Left Phuket and headed to Koh Lanta for the first portion of the PADI Tech on Tour. Day 1 in the Pool at the Pimalai Resort and Spa, PADI and Ben Reymenants conducted Tech ‘Try Dives’ with two groups from two 5 Star PADI dive centres, Scubafish and Anti-Gravity Divers. After an introduction, Ben demonstrated the various equipment involved with some of the most taught and most popular Tech causes – Sidemounts, Rebreathers and Twin Sets. Ben then challenged the aspiring Techies in the pool, to learn, practice and master various skills associated with these courses, before being tested on how well they’d taken the newly acquired skills on board. The feedback from the groups was that the Sidemounts were extremely comfortable, fun and easy to use, enabling flexible and fluid movements in the water. Buoyancy with this unit was also very easy to control and master. 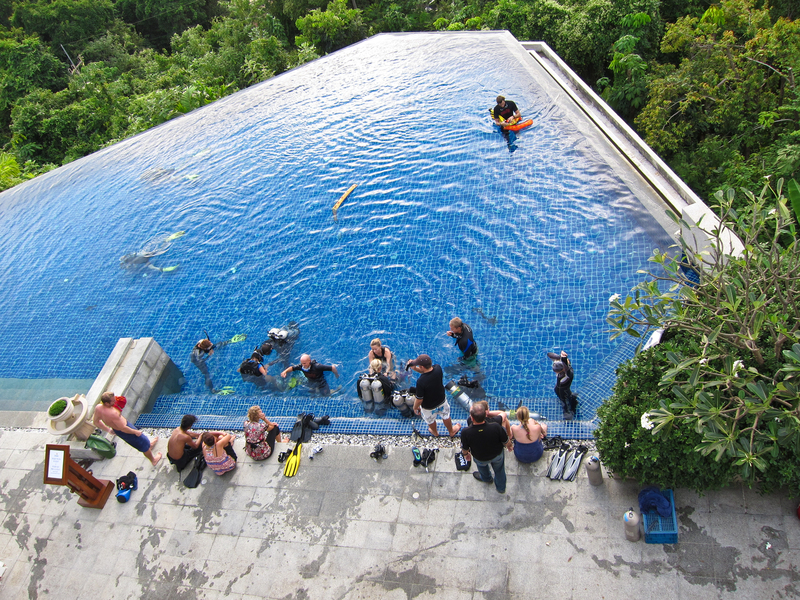 The majority of the aspiring Techies are now eagerly anticipating the launch of the PADI Sidemount course. Some of the aspiring Techies found the Twin Sets the most difficult to become accustomed to, being at times a bit uncomfortable and bulky, and making buoyancy relatively difficult to control. However, it was generally agreed that given a bit more time, practice and patience, these units could also be mastered. The Rebreather was also very popular, some found buoyancy a bit difficult to control again, but generally the unit was found to enable good fluid motion in the water. In confined shallow water, it is understandably more difficult to grasp a truly reflective overall feel of each of these units, compared to the greater depths of the open water, and more extensive training and development opportunities. However, for the majority, the chance to try these units on a rotation with one on one personal instruction was an extremely lucrative opportunity gratefully received by all, and has now firmly opened the doorway to the Tec side of diving. On the Evening of the First Day, we held a Go Pro and Go Tech Event with Scubafish Dive Centre. The Event turned out to be extremely successful, with a great turnout, and many of the Instructors that attended expressed serious interest in becoming Tech Instructors. During the Second Day itself, we held the Try Dives at New Beach. The turnout was even more fantastic than the day before, and we got a great rotation going with the units. The reviews, comments and feedback were all very positive, with the Rebreather being particularly popular, closely followed by the Sidemounts and the Twin Sets. The overall turnout from both days was more than 50 for Tech Try Dives, and almost 60 for the Go Pro and Go Tech Events. The Go Pro and Go Tech Event held this evening again had a fantastic reception and great turnout, again producing a lot of interest in zero to hero Tech packages. A huge thank you to Ben Reymenants and Blue Label Diving for their fantastic hard work and support. If any dive centre managers or owners reading this should wish to hold similar events at their facilities anywhere in Thailand, please get in touch with Tony Andrews at tony.andrews@padi.com.au. Following up from the PADI Tec on Tour event in Ko Lanta, I wanted to pass on a heartfelt thanks on behalf of all the team at Scubafish. We unanimously felt that this was a great initiative from PADI to help raise Ko Lanta’s diving profile and both our staff and diving guests came away with a hugely positive feeling towards PADI and a desire to learn more about Tec diving after a great taster/introduction, equipment trial and basic skills session. It felt great that PADI had proactively suggested, supported, organised and funded an event in our area that generated such genuine interest and excitement amongst, not just Scubafish staff and guests, but to many divers and other dive shops on the island. We hope there will be many more to come! We’d like to thank Tony Andrews and the team from Blue Label Diving (Ben and Simone) for bringing the Tec On Tour to Lanta, giving us the chance to try out some Tec configurations. I myself have spent the off-season getting trained in Tec, due in no small part to this event.